Chennaiyin FC B drew 1-1 with South United FC at the Bangalore Football Stadium in the 2nd Division League here today. A goal in stoppage time by striker Krishna Pandit helped CFC B salvage a point after South United had taken a first-half lead. Both encounters between CFC B and South United FC have ended in draws, with the reverse fixture in Chennai having finished 3-3 last month. Chennaiyin FC B will be back at the Bangalore Football Stadium on Monday 11th March 2019 to take on Ozone FC in their next 2nd Division League fixture. CFC B made one change to the side that narrowly lost 2-1 to Fateh Hyderabad in their previous outing. Forward Vijay Thangavel came into the starting eleven in place of midfielder Zonunmawia. 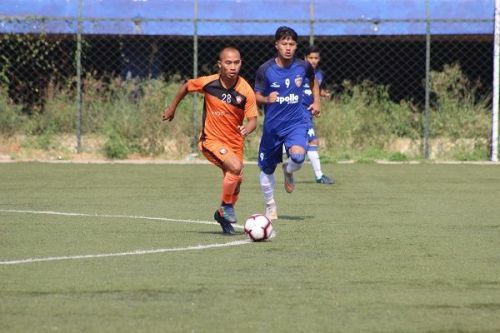 On a hot and humid afternoon on the artificial turf of the Bangalore Football Stadium, both sides found it difficult to find a foothold in the first half. South United took the lead in fortuitous circumstances in the 15th minute when CFC keeper Samik Mitra misjudged the flight of the ball, and it went in off him after striking the post. The goal being credited to SUFC's David Lalbiakzara who had taken the shot. Chennaiyin however continued to keep hold of the ball but were unable to test the SUFC keeper. The side from Bengaluru played more on the break and created a few half chances as they went in a goal ahead. CFC B continued to see more of the ball after the break, as they kept probing South United in search of the equalizer. The best chance of the half fell to CFC striker Bawlte Rohmingthanga, whose goal-bound header from substitute Joseph Lalsanglura's cross was kept out brilliantly by the SUFC keeper. The bulk of the action was in the South United half as CFC kept coming at them, but the final incisive pass was lacking from the visitors. South United almost doubled the lead after a lapse of concentration at the back for CFC, but Samik made a crucial double save to keep his side in the game. Chennaiyin FC B didn't give up and the leveller eventually came in stoppage time. South United failed to clear a CFC corner in the closing stages, as striker Krishna Pandit pounced on the loose ball and turned it in.